» FREE FLOATING, HYBRID OR DOCKING? FREE FLOATING, HYBRID OR DOCKING? The Amsterdam city government recently decided that they are going to remove free floating rental bikes from the streets. Many other European cities have come to this conclusion too. The argument is that the free floating system doesn’t help to reduce the number of bikes in the city and in essence this is simply a migration of bike rental shops onto the streets. Each local government is currently investigating the problem and is in need of further regulation if it wants to keep on stimulating bike entrepreneurs. X-Bike’s advice when it comes to local policies and the various possible ways of sharing bikes is simple: research, moderation and rule making. Be aware of what cycling means in your city. How many bikes, how many rides, how many users, the quality of the product and much more. Increase the number of bikes gradually to meet the demand of the users. Make rules for your system or in other words make it ‘hybrid’. 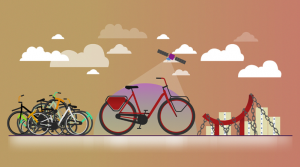 Use the geofencing techniques to regulate different areas at once and use different bikes for different terrains and/or user demographics.